Due to the overwhelming response from our loyal visitors, we have improved the website’s functionality for convenience and improved performance. 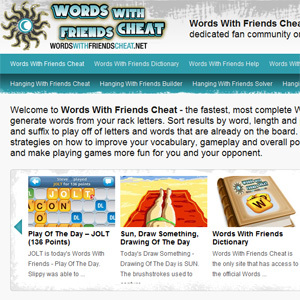 We will be featuring articles about strategy, word building scenarios and news/events in the world of Words With Friends. The new site features a brand new design and layout that is much more user friendly, more strategy and cheat articles and, in the future: forums for users participation, a mail list sign-up and screenshot upload to share your biggest point plays. Thank you for using WordsWithFriendsCheat.net and feel free to leave comments or feedback on new improvements you would like to see on the site. Looks great! However I use the old site because I prefer to be able to sort. This feature has been removed. But looks good nonetheless. Thanks. Thanks for pointing that out. We must have missed that during development and testing. We’ll get that added to the new interface. WWFC2.0 doesn’t sort by highest points. I’m sorry Vicki. You are correct. We are working on fixing this issue. Hopefully we will have that functionality added in the next couple of days.